Their cover of the Isleys’ ’62 classic remains a punchy party pleaser, while the ‘Back In The USSR’ A-side is a faster fave of less lasting value. A must for MoR jocks and fun for all, this zany blending of Herb Alpert’s first hit with the Mexican knees-up which inspired ‘Twist And Shout’ is pure party music at its best. Ole! Britain’s best Rockabilly group are already the people’s choice on London’s Capital Radio, as was ‘Jungle Rock’ before them. Ivor (sic) play their brand new pounding rhythm bopper or they’ll smash your face! At last, a Queen hit with danceable beat and no mucking around! An ex-Mod, Roger Chapman gives a raucously raunchy new rock appeal to Derek Martin’s mid-60s soul theme. Gently pulsating subtle airy prettiness from Patrick Campbell-Lyons. Originally by Frances Langford in 1936’s ‘Every Night At Eight’, this dreamy smoocher is one of the better Sarstedt copyists. The tune played again by Sam (Dooley Wilson) in 1943’s ‘Casablanca’ now has an unnecessarily brisk tempo but remains evocatively lovely MoR. Happy-go-lucky little rinky-tinky ragtimer, amusingly twee as MoR. Mrs. J. J. Barrie, nee Sparkle, on a New Seekers-type swayer that’ll be good MoR if it hits. Not out here for another two weeks or so, the BT’s newie is too hot to hold! Reflecting the success of stablemates Brass Construction, they’re in a bigger and better leapingly funky bag on the kilowatt killer ‘Can’t Stop Groovin’ Now, Wanna Do It Some More’, while other leading lights are ‘Depend On Yourself‘, ‘Energy To Burn‘ and ‘Energy Level‘. Energy’s the word . . . phew! 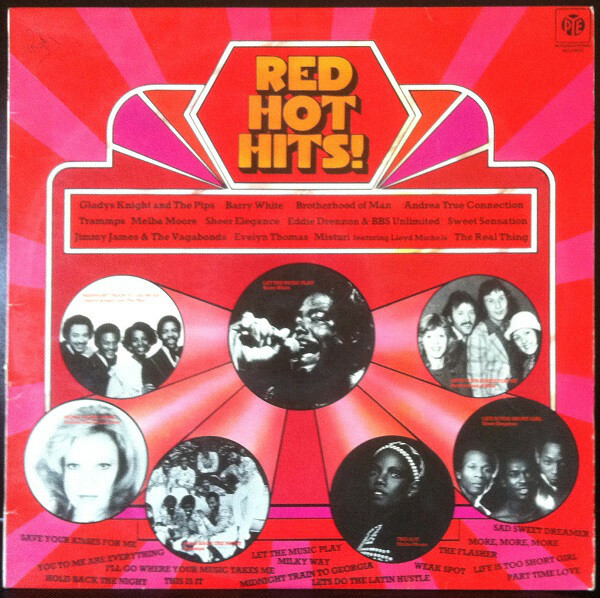 So red hot it’s even pressed in red vinyl, this incredible collection contains the current hits by THE REAL THING, MELBA MOORE, MISTURA, ANDREA TRUE, GLADYS KNIGHT and ‘Save Your Kisses’ by BROTHERHOOD OF MAN, plus recent hits by JIMMY JAMES & THE VAGABONDS, BARRY WHITE, EDDIE DRENNON, SHEER ELEGANCE, EVELYN THOMAS, THE TRAMMPS and SWEET SENSATION. Talk about good value! Recently huge in New York discos, these bouncily hustling instrumentals are like a lusher Atlanta Disco Band. Prime cuts are ‘Under The Skin’, ‘Last Chance To Dance‘, ‘Brothers Theme‘ and ‘Make Love‘. The Mar-Keys are still alive, and being produced by Booker T! Highlights of this instrumental album are the funkily hustling title track, with plenty of Booker T organ, the Brass Construction-like ‘Move Your Feet‘, and the brassily bouncing ‘80 Proof Red‘. Unexpectedly good. Though Lonnie’s lovely album is mainly full of atmospheric instrumental slowies, the lead track is a bubblingly frantic funky hustler called ‘Get Down Everybody (It’s Time For World Peace)’, with chanted vocals and multo disco appeal. Featuring the full 5:35 version of ‘Turn The Beat Around’, which is followed on side one by ‘Common Thief‘ and the title track, disco hits all. 06 05 Candi Staton – Young Hearts Run Free – Warner Bros.
10 09 Bellamy Brothers – Let Your Love Flow – Warner Bros.